With our trusty Vericom VC2000 data acquisition computer suction-cupped to the windshield, we delved into triple-digit speeds to test our big brake setup. Thanks to our good friend depreciation, the fifth-generation Corvette—1997-2004 model years—is now a true budget supercar that can be purchased for less than $25,000. Stratospheric speeds, neck-wrenching cornering and a thundering V8 engine are some of the car’s many strong points. The Z06 is the best of the C5 breed, featuring more horsepower, a stiffer suspension and an even more impressive wheel and tire package. While Z06 pricing has remained higher than garden-variety Vettes, the Z06 is not immune to the ravages that time has wrought on resale values. Thanks to the C5 Corvette’s depreciation curve, we’re now seeing them on a regular basis at track day events. With this increase in track use, there’s been a corresponding boom in the number of track-ready big brake kits for the Corvette. It’s not that the Corvette’s anchors are found lacking by most enthusiasts. 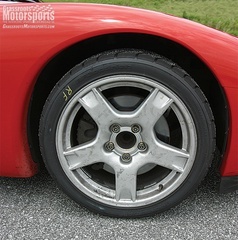 Like all C5s, the Corvette Z06 came equipped with 12.6-inch ventilated rotors on all four corners teamed with two-piston PBR front calipers and single-piston calipers in the rear. These parts are helped by a very well-engineered Bosch four-channel ABS system. 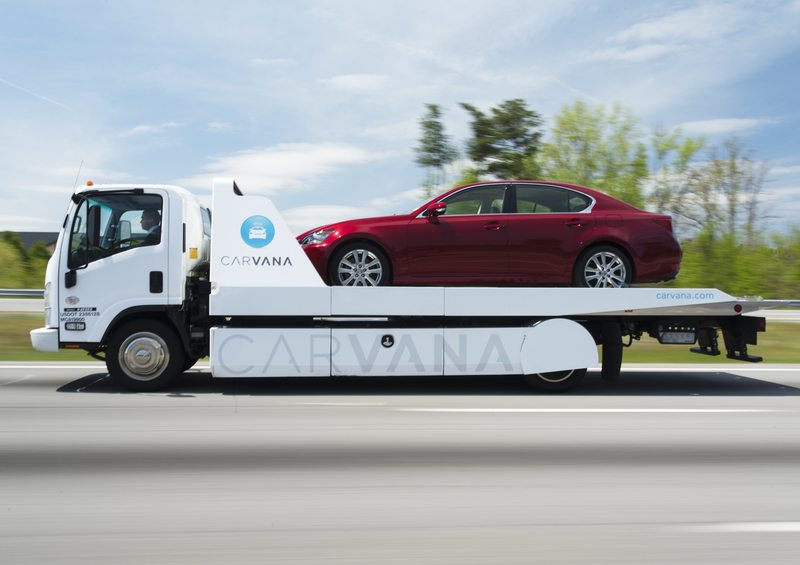 The entire package can haul the 3100-pound Corvette from 60 mph to a standstill in just 105 feet. Enthusiasts being what they are, however, some people just want more. The stock Corvette Z06 discs and calipers are generous for street use, but for repeated high-speed stops even the mighty Corvette can benefit from a brake upgrade. To test braking improvements on a car of the Corvette’s caliber, we clearly had to test the brakes at higher speeds in a controlled environment. 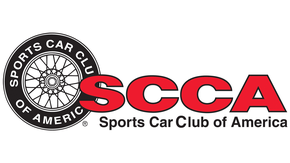 We simply didn’t feel that the speeds seen during daily commuting—or even autocross competition—would cause the stock brakes to even break a sweat. So for this test session, we traveled to Michelin’s Laurens Proving Ground in South Carolina to use one of their high-speed loops. Our vehicle would be a Corvette Z06 test mule in service at the facility. This Corvette was fitted with normal C5 18x9.5-inch rear wheels in the front positions and standard Z06 18x10.5-inch wheels in the rear. These were mounted with BFGoodrich g-Force T/A KD tires measuring 265/35ZR18 up front and 295/35ZR18 in the rear. Other than this wheel and tire package plus a full roll cage, the Z06 was completely stock. We first ran a series of baseline tests with the Corvette’s stock brakes. 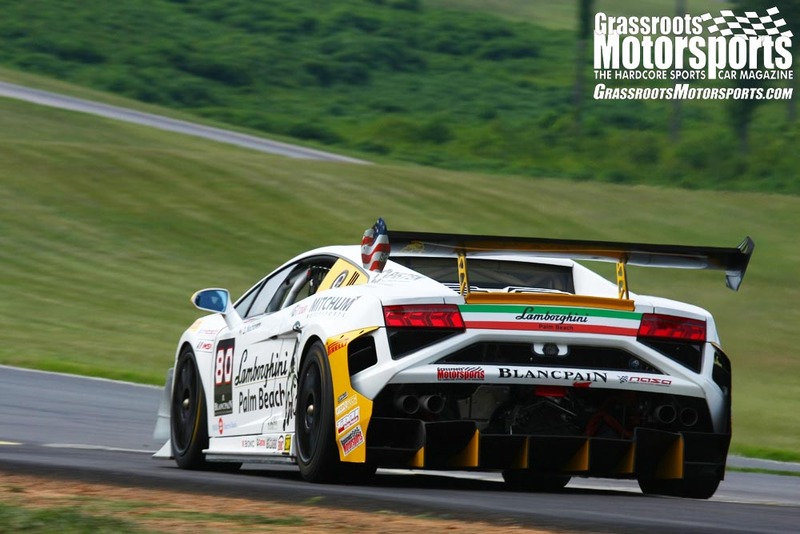 Using our Vericom VC2000 data logger, we measured the car’s braking performance from 120 mph. After each stop, we’d circle around the loop and use the same stretch of straightaway to repeat the braking test. This was repeated 10 times, and all of the distances and peak g-forces were recorded. 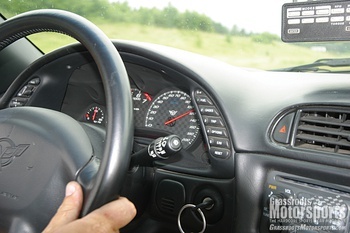 The data show that the near-stock Corvette had a mean stopping distance of 477 feet, recording 1.19 peak g on average. Due to the nature of the test, traversing back to the same section of pavement allowed the brakes some time to cool, so there was no measurable fade in the 10 stops. There was some increase in pedal effort as the brakes heated up, but the stopping distances did not increase. The smartly engineered Wilwood brakes use plenty of aluminum to save weight over the stock setup, and the installation is very straightforward. We then installed the large front and rear brake kits from Wilwood Engineering. The company has offered high-performance disc brake components since 1977, and they now sell a line of big brake kits designed to bolt onto many popular cars, from the MINI Cooper and Acura Integra to the Subaru Impreza WRX and Pontiac GTO. The Corvette front kit features very lightweight billet-aluminum, six-piston Billet Superlite calipers, machined aluminum rotor hats and 13-inch directional vane rotors with asymmetrical face slotting and individual dynamic balancing. The enormous calipers are mounted to the stock hubs using a billet aluminum adapter bracket. The front kit carries a list price of $2152.80. While this is not cheap, keep in mind the option of selling the stock Z06 front rotors to the owner of a late-model Camaro or Firebird to recoup some of the conversion costs. The rear kit consists of slightly smaller four-piston Billet SL4R calipers, two-piece, 12.90-inch vented rotors and a machined billet aluminum hub-to-caliper adapter. 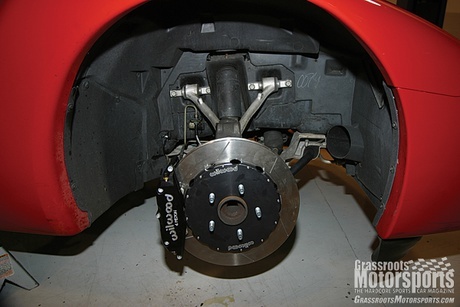 The rear rotor uses a cast-iron hat to work as the drum in the parking brake system. The rear kit is priced at $1979.18. Both kits can be ordered with either drilled and slotted rotors or un-drilled “competition” rotors. The two kits come with Wilwood’s PolyMatrix Q compound pads, which are recommended for street use. Wilwood’s extensive use of aluminum in the front components helps remove about 5.9 pounds per corner from the front of the Corvette. The rears, on the other hand, are about 3.6 pounds heavier per corner. This gives us a net loss of about 4.5 pounds. Although this doesn’t sound like a lot, removing unsprung weight really helps handling. This also shifts the weight bias slightly toward the rear of the car. While we were working on the brakes, we also replaced the front and rear flexible lines with Wilwood’s braided steel brake pieces for a better pedal feel. The front and rear lines are priced at $209.86 for the full set. We opted to use the more aggressive E compound PolyMatrix Q pads, which slide into the calipers easily with the removal of a retaining bar. Working on brakes can be an exercise in frustration, as bolts, fittings and hardware can become frozen with age, rust and repeated heat cycling. Adding to the stress is the fact that brakes are a vital part of the car and any mistake could cost lives. Thankfully, the removal of the stock Corvette brakes and the installation of the Wilwoods was simple and painless. Well, maybe not exactly painless. 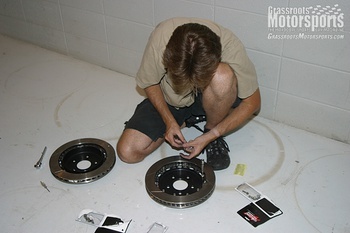 The assembly process includes bolting the hat and rotors together with small bolts. These bolts are then safety-wired to prevent them from backing out. Using safety wire and safety wire pliers is something that requires both experience and really calloused fingertips, as we learned when we drew some blood from our fingers during this process. After a few attempts, we got into the rhythm of feeding the wire through the bolt heads and twisting it tight. Both the front and rear kits went together with little trouble. The brake lines, likewise, were a perfect fit for the car. We then bled the brakes twice, once with the engine off and once with it running. The second time ensures that there aren’t any air bubbles trapped in the ABS pump. The pads were then bedded in through about a dozen hard braking runs from triple-digit speeds down to about 5 mph. The brakes were then allowed to cool for several hours to let the pads cure completely. Heading back out to the test loop, we were immediately aware of the improvement in pedal feel, braking balance and modulation. We’ve tested some impressive braking systems in the past, but the Wilwood kit for the Corvette simply shines. The braking numbers show a significant improvement, averaging 441 feet and 1.20 g from 120 mph to zero. An improvement of 36 feet is nothing to sneeze at, as this is more than two car lengths. The Wilwoods also shed heat more quickly than the stock system and there was no fade or increase in pedal effort throughout the braking runs. We have tested a lot of “upgraded” brake components through the years; some didn’t deliver as promised, while others yielded shorter stopping distances and improved performance. Put the Wilwood Corvette kit in the “success” column. Track events can tax the best of factory braking systems, but as we found, even a factory-tuned, high-performance car like the C5 Corvette can benefit from the right aftermarket hardware.